A Norwegian company is hoping to woo NATO with a revolutionary new product: "swimming" bullets that remain effective even after significant distances underwater. Additionally, the new superweapon's creators purport that its capable of taking out a submarine. The Norwegian company DSG Technology has produced CAV-X super-cavitating bullets, which due to a specially turned tip and carefully calibrated balance and mass can be shot through water, in an air bubble. The bubble enveloping the bullet has a frictionless surface, which reduces the drag through the water and increases speed. According to DSG Special Operations Forces Director Kristian Aksnes, the bullets are made of tungsten with a brass shell and are designed to be fired from conventional weapons, the web-portal Military.com reported. The Norwegian company ensured that the technology was completely scalable to all NATO calibers. At present, DSG offers 12.7, 7.62 and 5.56 millimeter bullets, as well as smaller calibers. The 12.7 mm bullet is compatible with submachine guns. It has an effective range of 2,200 meters if shot through the air and 60 meters underwater, DSG Technologies reported. The 7.62 and 5.56 rifle rounds have a range of 1,100 meters and 900 meters and are operative underwater at 22 and 14 meters, respectively. The product was released earlier this year, and has already been sold in small quantities to undisclosed international militaries for research and testing. 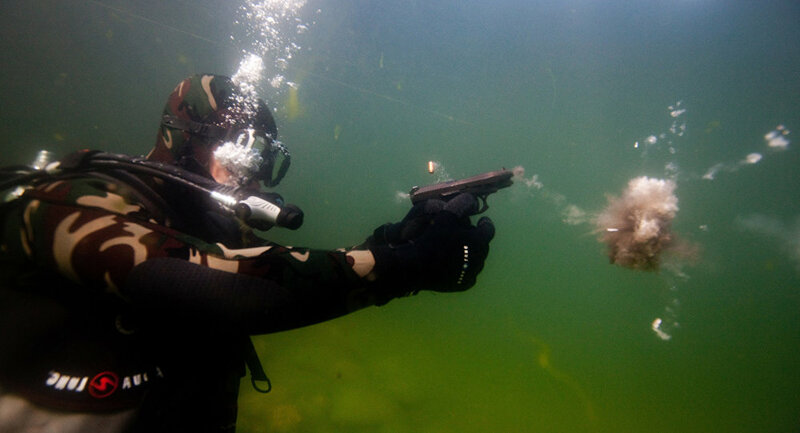 According to Aksnes, "many" countries are currently trying out the CAV-X bullets, which may come particularly handy for special operations teams, such as the NAVY Seals, who operate around water. According to Aksnes, the US military has also registered its interest. At larger calibers, the CAV-X technology has the potential to aid harbor and coastal defense and to assist in countermine and counter-torpedo operations, effectively destroying the enemy's mines and torpedoes. According to Aksnes, high-caliber versions of these bullets, when fired from a helicopter, could potentially even take out a submarine. DSG's offer will soon be complete with an underwater gun mount (UGM), which has been designed to be fixed on unmanned underwater vehicles and ships and is currently patent pending. DSG Technologies is based in the Norwegian capital Oslo and has an office on Cyprus. Water is much denser than air and makes bullets lose their velocity fast. Regular bullets also tend to be inaccurate and have a short range underwater, which considerably limits their utility. A feature known as supercavitation is something militaries have long investigated and applied to the creation of faster torpedoes or underwater vehicles. An example of a supercavitating torpedo is the Russian-built Khishchnik ("Predator"), which is a successor to the 1970s' Shkval ("Squall"). Additionally, the Soviet and Russian Navy are known to have used the APS underwater assault rifle since the 1970s.